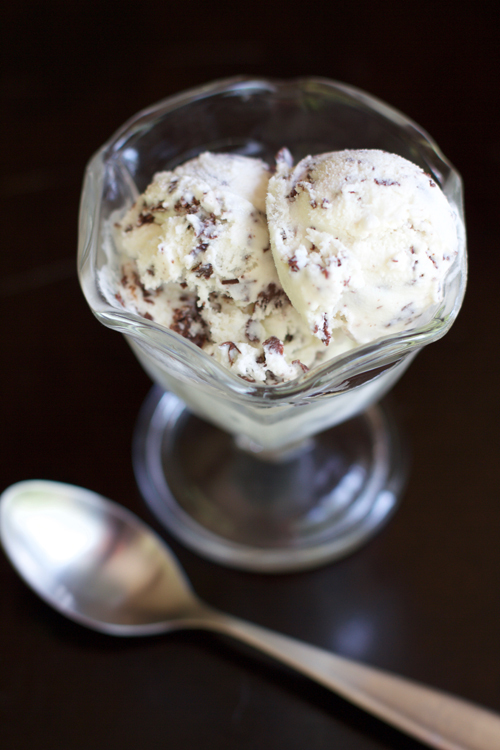 Mint chocolate chip is my favorite flavor of ice cream, and this recipe using fresh mint leaves and semisweet chocolate has taken my love for this flavor combination to a whole new level. An automatic ice cream maker is a dangerous appliance to own. (I have this Cuisinart one.) Especially after you make ice cream for the first time and realize just how dang easy it really is. Looks like I'm going to need to amp up my summertime workout schedule to combat my love for freshly made ice cream. I have always been a fan of mint chocolate chip ice cream, or "toothpaste" ice cream, as my Dad likes to call it. Whether bright green or white in color, if it has a minty flavor and a plethora of chocolate chips, I am in. Prior to purchasing an automatic ice cream maker, we had a hand-crank one. So, while I am no stranger to homemade ice cream, I have to admit we never veered from my favorite vanilla ice cream recipe. I figured my favorite flavor was a good place to start in my foray into "exotic" flavors of ice cream. 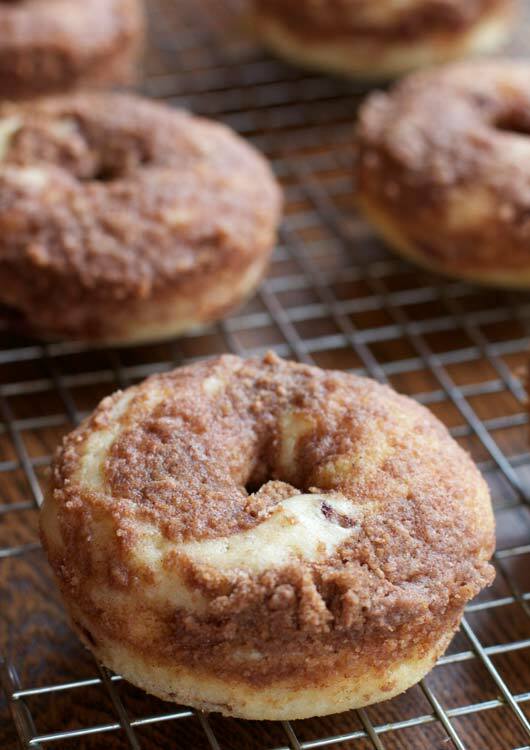 And seriously, this recipe does not disappoint. 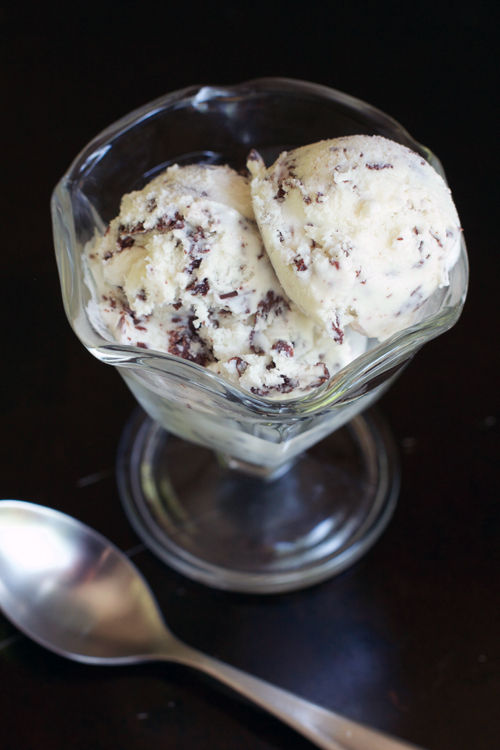 This recipe is for a Philadelphia-style ice cream, meaning the recipe contains no eggs. There's no tempering, no extra straining, no setting up of an ice bath. Truthfully, this recipe is very easy. The worst part is waiting the requisite amount of chilling time (three hours or up to overnight) before churning the ice cream. If you like mint chip ice cream, I think you'll like this. Its refreshing flavor is the perfect complement to a hot summer's day. 1. Pour 1 cup heavy cream into a medium heavy-bottomed pan. Stir in the sugar, pinch of salt, and fresh mint leaves. Stir over medium heat until all of the sugar has dissolved in the cream. 2. Remove the pan from the heat and pour in the remaining 1 cup of heavy cream and 1 cup of whole milk. Stir to combine. 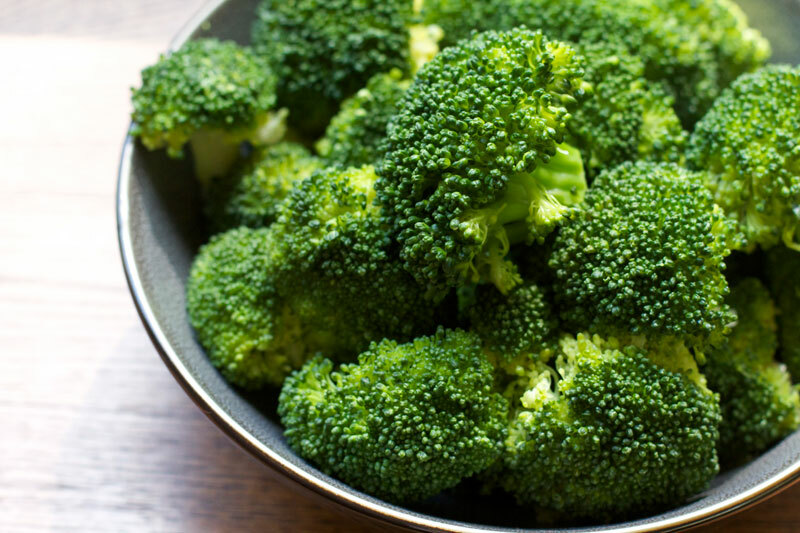 Pour the mixture into a bowl, cover, and refrigerate for at least three hours or overnight. The longer the mixture steeps, the greater the mint flavor. 3. When ready to churn the ice cream, strain the custard to remove the mint leaves. Freeze the ice cream in your ice cream maker according to the manufacturer's instructions. 4. 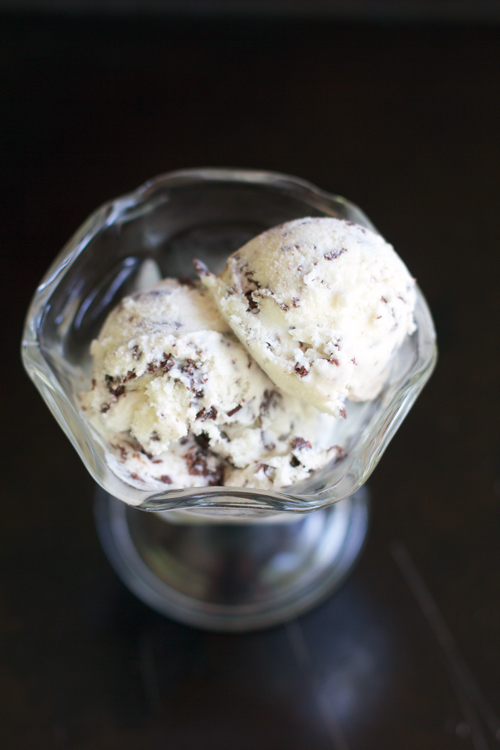 While the ice cream is churning, melt the chocolate with the coconut oil using the microwave or a double-boiler. Stir until smooth. When the ice cream is nearly finished churning, pour the melted chocolate in a slow stream into the ice cream maker. 5. Serve immediately (the ice cream will be soft) or scoop the ice cream into a freezer-safe container and chill until firm.